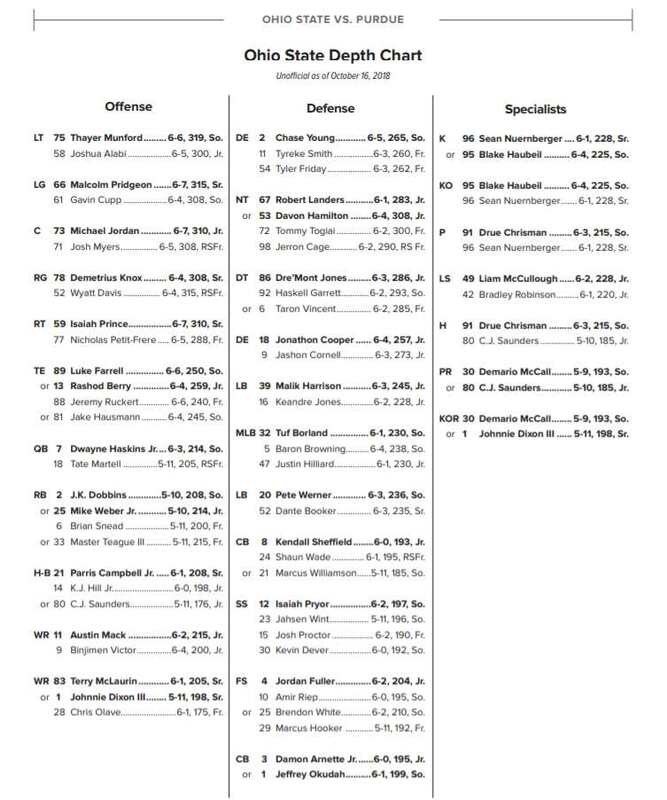 COLUMBUS — The Buckeyes have lost three fifth-year senior receivers in Terry McLaurin, Johnnie Dixon, and Parris Campbell from last year’s team. As key cogs of Ohio State’s receiving group — better known as “Zone 6” — they set the standard for what OSU receivers should be. With all three off to the NFL, the younger members of Zone 6 now have big shoes to fill. In filling those shoes, however, they also have the opportunity to become the next Buckeye greats like those before them. Spring practice was the first opportunity for several young receivers to step up and show that they are ready for an increased role on the field this fall. Earlier this spring, head coach Ryan Day mentioned that the receivers returning to the team are going to have to play like veterans if they want to be successful this season. He mentioned senior Austin Mack, fifth-year senior KJ Hill, and senior Ben Victor as the guys who bring the experience to the unit. Victor led all receivers in Saturday’s Ohio State spring game with two receptions for 107 yards and a touchdown. Hill had two catches for 43 yards, and Mack finished with two receptions for 24 yards. The older and more experienced players were not on the field often, which allowed the younger players a chance to make their marks. 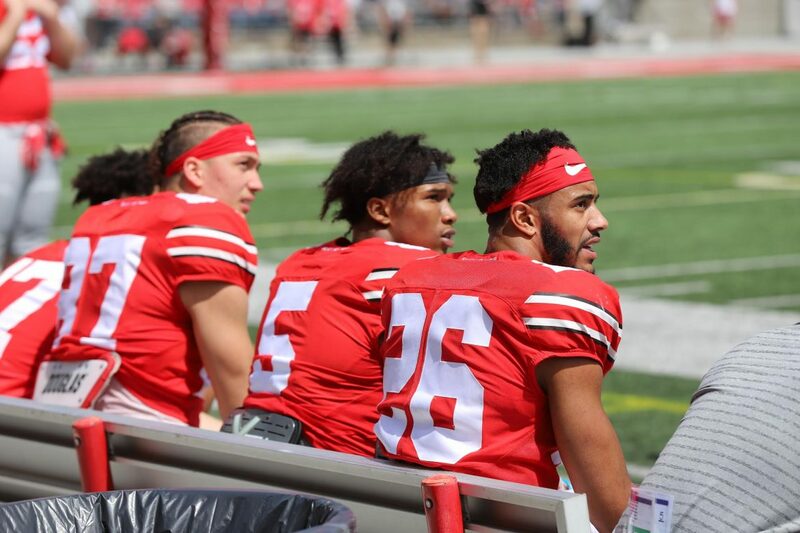 Day was also adamant that along with needing the veterans to step up, the young receivers are going to have to contribute in the rotation and make an impact to maintain the level of depth that Zone 6 has had in the past. On Saturday, a handful of young Buckeye receivers began that process by making plays and setting the tone for more to come this season. Redshirt freshman H-back Jaelen Gill totaled seven receptions for 95 yards. Redshirt sophomore wide receiver Ellijah Gardiner had two receptions for 72 yards. Freshman wideout Garrett Wilson finished the day with four receptions for 44 yards and one touchdown. Wilson’s touchdown came on an 18-yard pass from redshirt freshman quarterback Matthew Baldwin in the second quarter of the game. Baldwin essentially threw up a jump ball to Wilson, who was being covered by sophomore cornerback Sevyn Banks. Wilson maneuvered himself behind Banks and simply outjumped him for the ball, bringing it in for the score. Coaches and players have raved about Wilson all spring. KJ Hill said that Wilson is a coachable player who has developed and matured throughout the spring. His touchdown catch on Saturday came as no surprise. Hill also wouldn’t be surprised to see Wilson leaving a legacy at Ohio State. Although Saturday’s spring game is only one flash of what their respective games truly look like, the new faces of Zone 6 showed that the future is quite bright and full of promise. I think this roster top to bottom is the most talented roster we’ve ever had here. We barely had 2 capable wr’s under any previous HC. Under Meyer 6. Totally different level of recruiting. I don’t know about everyone else, but I am VERY excited about this coming season. Everyone is expecting a step down given the losses to the NFL and Meyer’s leaving, but I think this team has the potential to be better than last season. My main questions concern whether Fields is the real deal, and the secondary. Go Bucks!